You may continue to make payments and keep the car. 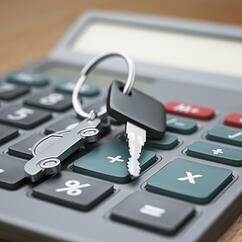 You may pay the value of the car to the creditor and keep the car. If you got stuck paying too much for a vehicle that is no longer worth what is owed, it may be time to walk away and surrender the car. If you choose to surrender the car to the creditor, you will not be responsible for making payments or for the deficiency balance (difference between the amount owed and the amount the car is sold for at auction). The question that is often asked is "Do I have to drop off the car to the dealer"? In practice "surrender" means the creditor is not prevented from taking whatever legal recourse it has to in order to recover the car. Some people prefer to call the creditor and make arrangements to drop it off. Others try to hang onto the car as long as possible. How the surrender is actually effectuated is not an issue the bankruptcy court typically gets involved with. Keep in mind, that if you are behind on payments on the car, don't let that be the determining factor in whether you keep or surrender the car. So long as you can make future payments timely, the past due amount may be cured through a chapter 13 plan. This is true even if the car was repossessed so long as it hasn't been sold at auction yet. If you need help with an auto reposession, contact our bankruptcy attorneys today for a free consultation.